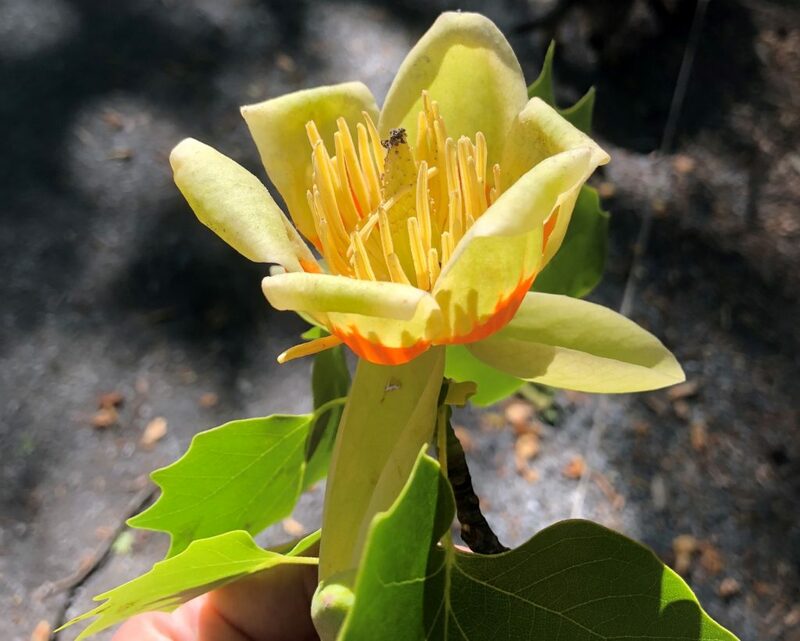 Liriodendron tulipfera, the Tulip Tree is also called yellow poplar or whitewood, North American ornamental and timber tree of the magnolia family (Magnoliaceae), order Magnoliales. The name Liriodendron is Greek for “lily tree”, but it is not closely related to true lilies, tulips or poplars. The tulip tree is the state tree of Indiana, Kentucky, and Tennessee. Its large flowers are unique among hardy trees and can be seen in April and early May in Georgia. The flowers are a big draw for honeybees. A tree can produce eight pounds of nectar, which bees are able to convert into four pounds of dark amber honey. The honey is fairly strong which is favorably regarded by bakers. The tulip tree is one of the largest of the native trees of the eastern United States and it can attain a height of 60 meters (197 feet). A tulip tree reaches its full stature in approximately 200 years. Posted in Outdoors and tagged Blooming Tree. Bookmark the permalink.